However, I also believe in setting goals and being wise about taking care of our body. Having excess adipose tissue(fat) around our organs is especially dangerous and harmful to our health. If you have a goal of weight loss I want to share with you the most effective way to exercise at least 2-3 times a week. I would pair it with strictly strength, cardio and/or flexibility the other days. If you have attended one of my group fitness classes you know I'm a big fan of interval training. Not only does the time go by quicker but you also burn more fat than traditional exercise. When I was in college I studied Exercise Physiology and when one of my professors broke down the physiology of what is happening in our bodies when we exercise it was as though a light bulb finally came on for me. Because I am a "why" girl once you explain in depth the reason behind why something works I will be sold for life. 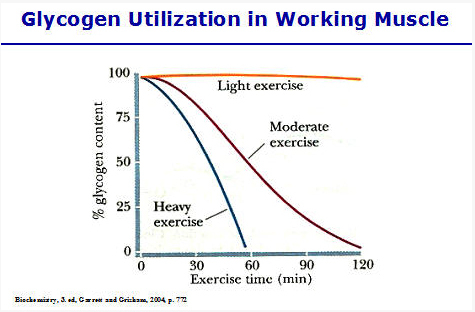 But as you can see in the graph below it's not just the length of time you exercise but instead the intensity. Doing moderate exercise does have health benefits but just not for fat burning purposes. The other reason intervals are so amazing is because our heart rate goes up and back down with strength being your active recovery. Any time your body has to readjust to what it's going through it has to work to get back to homeostasis. Meaning it wants to be comfortable so it fights to get back there, otherwise known as burning calories. Our body does not think in terms of how it looks it is only concerned about surviving. In order to survive that exercise session it will pull out all the stops, including releasing fat to be burned, in order to protect itself. You must, however, get it to the point of wanting to survive, which is why I love HIIT(High Intensity Interval Training). It shocks the body and without thinking too hard about it starts releasing fat in order to survive. Not to mention the EPOC(excess post oxygen consumption) that comes from interval and HIIT training, which also burns excess calories for 8 hours after intense exercise. This same principle can be applied to one of your weight lifting days. If you lift weights for 30 minutes and you follow it by a short 10 minute run at the END you will burn more fat because you utilized the glycogen in your muscles during the strength training. Put simply, doing interval and HIIT training will be a shorter workout, burn more fat, train both anaerobic and aerobic pathways and recondition your body in a way it hasn't experienced before. Feel free to use the format above to put your own exercises in those slots or check out the programs Beachbody has to offer. QUESTION: Do you periscope? I don't yet but am considering doing live workouts on it a few times a week. Let me know if that's something you would be interested in! The Fat Burning Kitchen Book is a nutritional eBook written by Mike Geary and Catherine Ebeling. The Fat Burning Kitchen is extremely easy to read and implement. Online programs contain fat loss exercise regimes. The regimes are designed help individuals loss fat and to help them stay fit and healthy. This gives the dieter access to the latest information on trends related to fat loss. Other fat loss products like diet supplements can be ordered through the online program. Reference - Paul, B., n.d. Deer Antler Velvet Dr. Recommended Formula. [WWW Document]. HGHOfficial.com, i.e. HGH Official. URL, https://hghofficial.com/deer-antler-velvet-supplement/ (accessed 03.15.19). Is God part of your fitness journey?